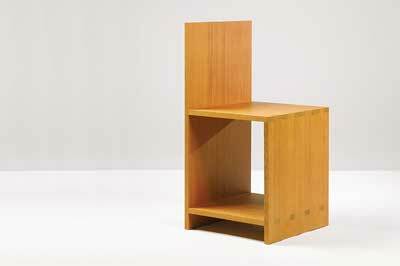 This piece entitled 'Chair', was made by Cooper/Kato, New York in 1984 from Douglas fir (Pseudotsuga menziesii). It sold for $100,000 in December 2013 at Sotheby's. The designer was Donald Judd (1928-1994). The chair was designed by a sculptor, not a furniture maker. You may mutter under your breath "that's pretty obvious." But Donald Judd was a very important figure in 20th-century design. In the 1960s, he was one of the main minimalists. For him colour, form, space and materials were what he wanted to emphasise. Notice the word 'function' is missing! His work is on the boundary of sculpture and furniture and, as such, it is important for furniture designers to be aware of it. Too often we miss the sculptural forms in our purposeful everyday furniture. His rigorous, almost visually hurtful shapes, reduced down to essentials can make one think "what are the basics of what I am doing as a furniture maker?" Judd chose to use vertical grain Douglas fir in many of his works, with the wood processed in completely opposite ways: through and through sawn versus rotary peeled led to very different visual appearances on the same physical shape. This interest in industrial materials is typical of the artist's exploration of what we as furniture makers see as a structural and engineering choice. In this case, the jointing system, namely dovetails, is one that we would recognise. In 1996 the Judd Foundation was set up to preserve the work and installations of Donald Judd in Marfa, Texas and at 101 Spring Street in New York.